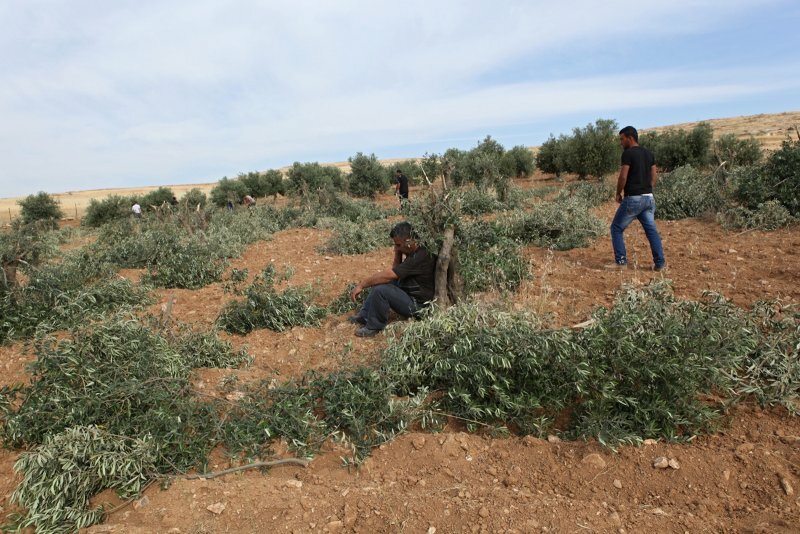 On May the 10th at about 6 a.m. some Palestinians from At-Tuwani and two Operation Dove volunteers found out that 62 olive trees had been cut during the night in a field next to the Bypass road 317. 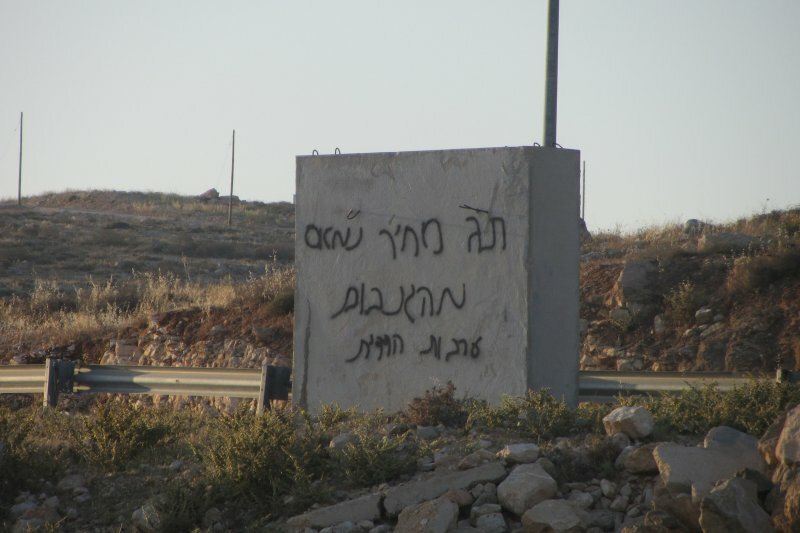 On a small wall nearby the olive field the sentence “price tag for those who steal” was found. 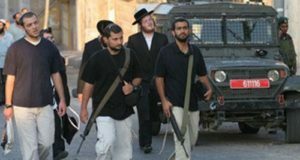 The “price tag policy” (Hebrew: מדיניות תג מחיר) is, according to B’Tselem, the name given to “acts of random violence aimed at the Palestinian population and Israeli security forces” by radical Israeli settlers, who, according to the New York Times, “exact a price from local Palestinians or from the Israeli security forces for any action taken against their settlement enterprise”. The olive trees grove belongs to the Amor Palestinian family and had been planted approximately 30 years ago. The members of the family which were present on the scene were particularly shocked for the loss. The first jeep of soldiers arrived at about 7 a.m. followed by another army vehicle and a DCO (District Coordination Office) car. Around 7.30 a.m. a police car reached the area and an officer taped the incident’s scene with a camera. One member of the owner family spoke with the policeman giving him some information about the history of the olive trees. The Israeli police did not speak with the international volunteers and did not give any further details about the investigation. Around 8 a.m. Ma’on security chief arrived near the olive trees, spoke with the police and the soldiers and took some pictures. 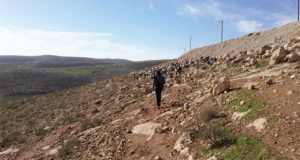 Some ten minutes later a DCO officer tried to detain a Palestinian shepherd from At-Tuwani accusing him of lacking respect to his authority. The Palestinian man denied and claimed that he did not say nothing bad to the officer. Around 8.30 a.m. an Israeli soldier in charge of analyzing footprints started his investigation on the field. At the end of his research he declared that 6 people damaged the olive trees (5 men and 1 woman) while others were watching from distance. In the afternoon, at about 2.30 p.m. a group of settlers set fire to a Palestinian wheat field close to the Palestinan village of Tuba. A Palestinian teenager saw them from distance while they were running away. The field belongs to the Aliawad family that has immediately called the Israeli police. When the police arrived the kid and his brother have been driven to the police station of Kiryat Arba for filing a complaint. 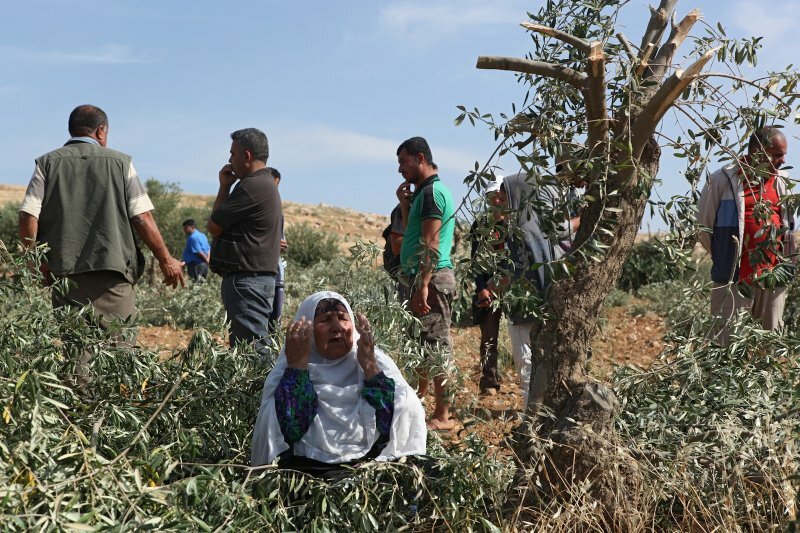 The olive trees and the wheat are an essential resource for the Palestinian community in South Hebron Hills area and their damaging causes a serious economic loss. 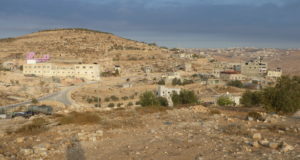 Nevertheless the Palestinian communities of the South Hebron Hills area are still strongly committed in the nonviolent popular resistance against Israeli occupation.